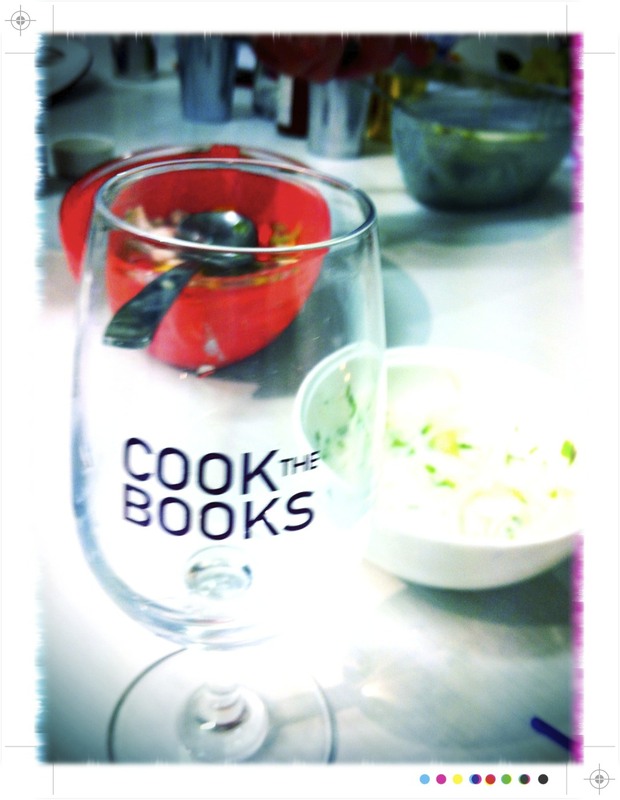 Last week saw another visit to Cook the Books. I just can't resist the opportunity to try something new. This time it was for some lessons in cebiches and Latin seafood with Grace Ramirez. 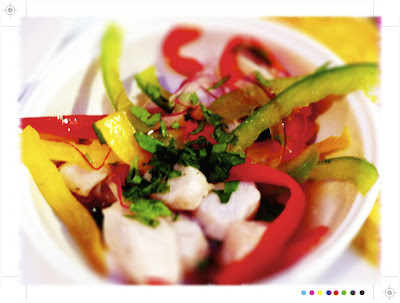 Cebiche or ceviche or seviche is typically raw fish marinated in citrus and spiced with the likes of chilli, salt, coriander and onions. 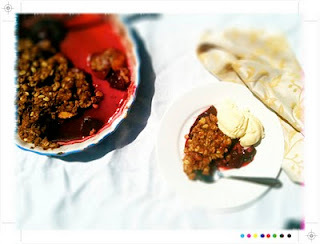 This is perfect summer food, fresh, light and bursting with flavour. 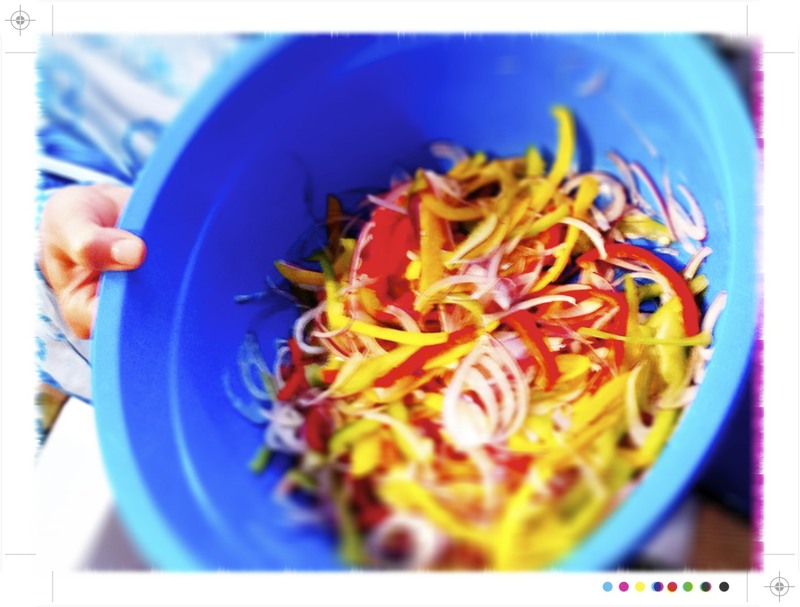 I loved this class; the bright colors, the vibrant flavours and and all those spicy chillies. 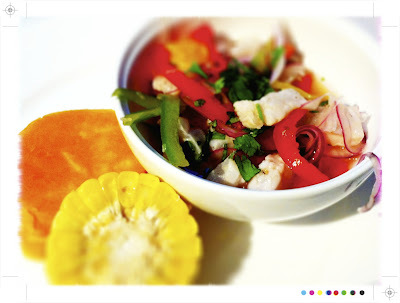 Ceviche is very popular in the Americas and a plethora of variations can be found along the coastal regions of Peru, Ecuador, Chile, Mexico, Argentina and in the Carribean. 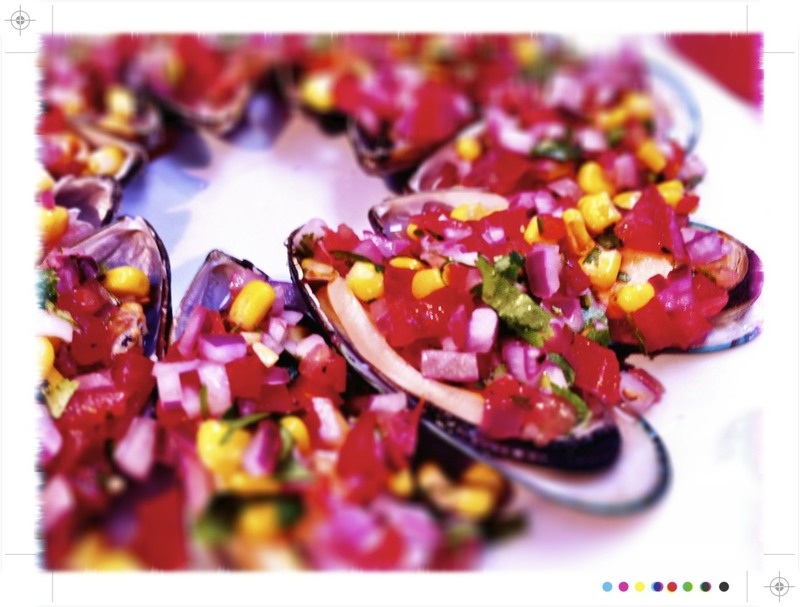 To start off there evening at Cook the Books we had Choros a la Chalaca, mussels done Peruvian style. 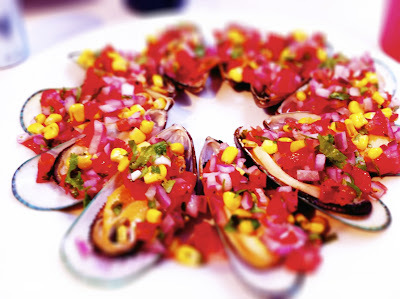 Mussels are gently steamed and then topped with a salsa of onion, corn, tomato, coriander and lemon juice. In Peru they even have a National Day of Ceviche. The classic Peruvian cebiche is raw fish marinated in freshly squeezed lime or bitter orange juice, with sliced onions, chilli, salt and pepper. It only takes around 20 minutes for the fish to marinate and then it is traditionally served with corn on the cob and sweet potato, both lending a sweetness that works so well with the tart citrus and chilli in the cebiche. Following on from the mussels we were treated to a lesson in Cebiche 101, the classic Peruvian cebiche. Any firm white fish, too delicate and the marinade will turn it all to mush, is mixed with sliced red, green and yellow peppers, sliced chillies, sliced red onions, salt and pepper and lime juice. Once the fish has turned opaque white it is ready and then a good bunch of coriander can be added. This was one of my favourite dishes of the night. The flavors are so fresh. The sharp tang of the lime and a wonderful heat from the birds eye chillies. It was even better with a few slices of fresh birds eye chilli and a splash of Melinda's Hot Sauce, a delightfully spicy habanero sauce that is quite addictive. And don't let all that spicy liquid or "leche de tigre" go to waste. Leche de tigre or tiger's milk is often served on the side in Peru and is apparently the perfect cure for a hangover and even an aphrodisiac. Alternatively to avoid the hangover completely it can be mixed with a Pisco shot! *Pisco is grape brandy produced in both Peru and Chile. Another favourite of the evening was the Scallop and Shrimp Cocktail. This one really is a keeper. Scallops and shrimp are gently poached and mixed in to sauce of tomato juice, fresh lime juice, a little orange juice, ketchup, a little hot sauce, Thai chillies, red onion and coriander along with some avocado. In Mexico this would be served with saltines, similar to Salada here in NZ. You can leave the chillies and hot sauce on the side so that people can add as much or as little heat as they like, however we had a class full of spice lovers so we went for the full monty. 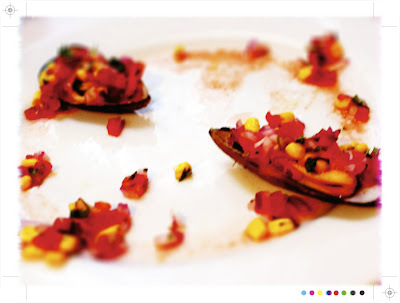 This would be a classic cebiche in Ecuador where it would be served with toast corn kernels; "patacones" and plantain chips called "chifles" again providing the sweet to go with the tang and the heat of the cebiche. 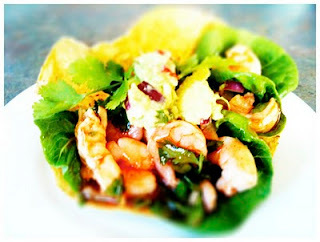 Sweet seafood, tangy lime and a little hint of orange juice in a spicy tomato sauce that leaves your lips tingling and just craving more and more....it would make for a great little starter in a crispy taco shell. 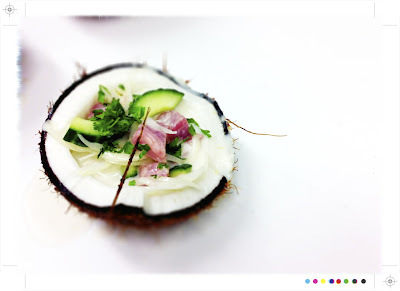 Nest stop a little more of a Pacific take on cebiche with Tuna and Coconut Milks. Diced tuna is marinated in coconut milk and lime juice along with cucumber and onion. For a truly Pacific starter it can be served in coconut shells. And if all that wasn't enough...you never, ever go hungry at Cook the Books; there was one more dish; Salmon Tiradito. 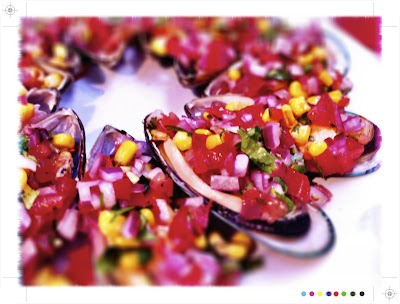 Tiradito is another Peruvian dish reflecting the influence of Japanese immigrant on their cuisine. It is similar to sashimi or carpaccio and a great hands on course for your guests at a dinner party. Even better it is unbelievably simple. 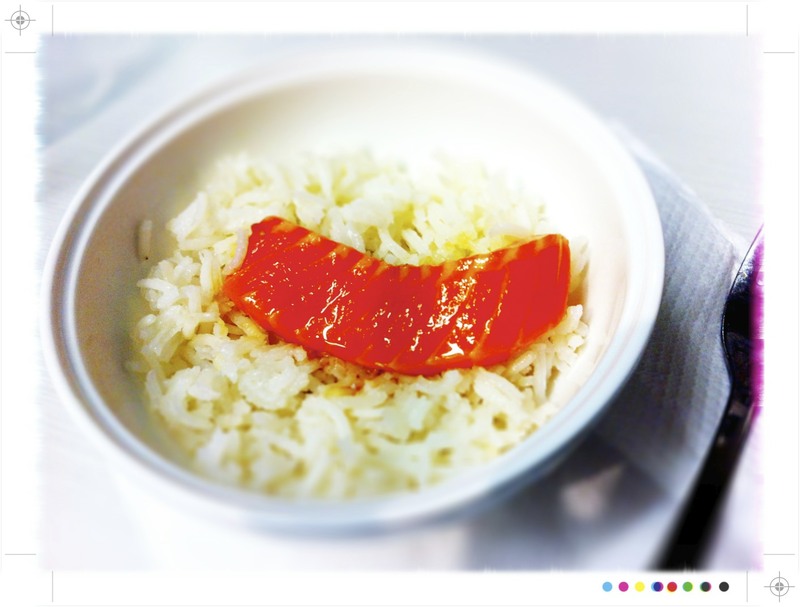 Fresh salmon is thinly sliced and placed on a platter. On the side a bowl of soy sauce and lime juice mixed together. Seriously, in a nutshell that is it. At the table just dip the slices of salmon in to the soy and lime mixture and wait a moment or two until the salmon turns a lighter, more opaque pink. Simply served with some white rice or salad this would definitely be a crowd pleaser. The sweet, almost buttery salon cut perfectly with the salt soy and zest lime. And just to note these are completely my own thoughts and opinions. You are so lucky to have Cook The Books offering such a wide range of culinary styles.Love reading about your adventures. At first I thought your mussel photo was of raw mussel but now I see they were lightly steamed. I've only ever had mussel cooked, but have heard of people eating them raw. Have you in your classes and foodie adventures ever heard about eating raw mussel? Pisco and spicy liquid sounds killer. I'd try it just once though. 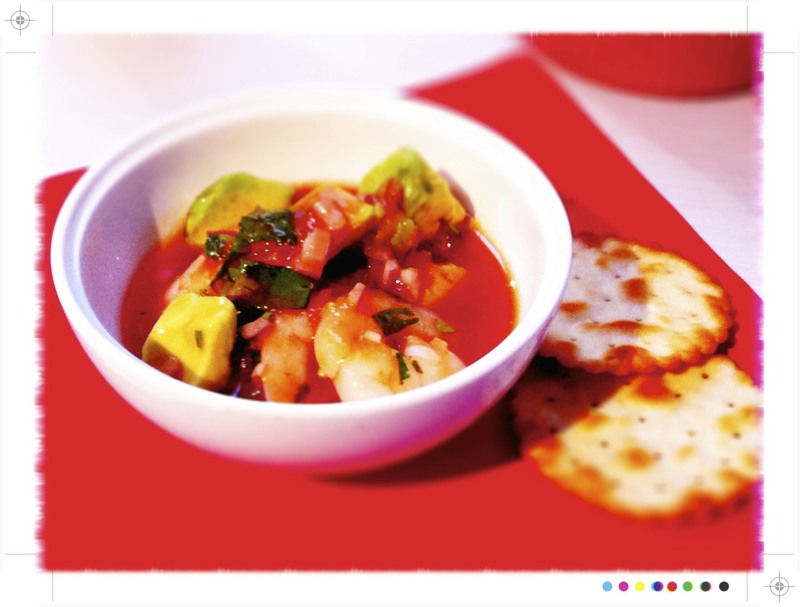 I made a tuna and coconut milk ceviche last year. It was divine and decadent using tuna instead of just a regular white fish. 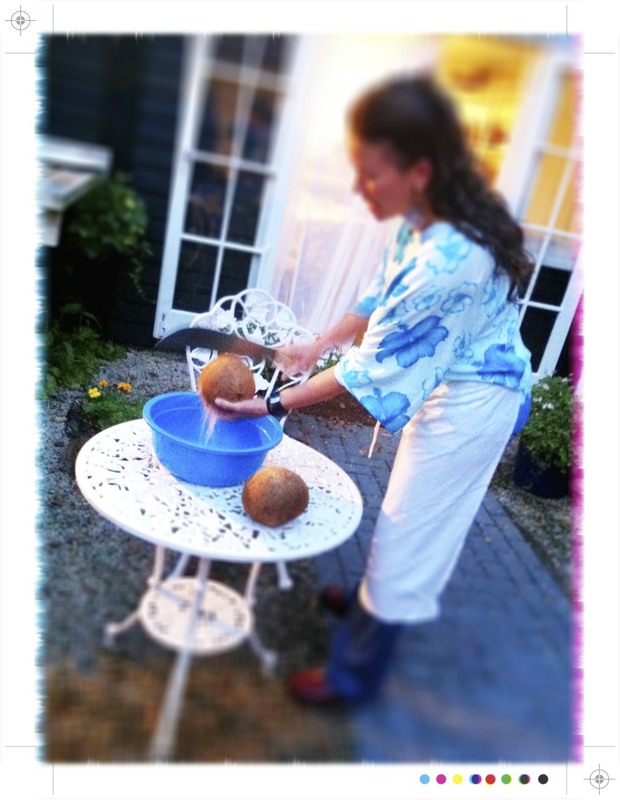 I love the presentation with the coconut shell.